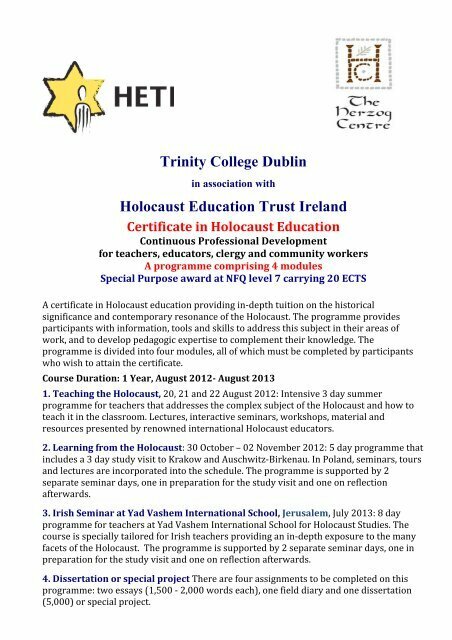 Trinity College Dublin in association with Holocaust Education Trust Ireland Certificate in Holocaust Education Continuous Professional Development for teachers, educators, clergy and community workers A programme comprising 4 modules Special Purpose award at NFQ level 7 carrying 20 ECTS A certificate in Holocaust education providing in-­‐depth tuition on the historical significance and contemporary resonance of the Holocaust. The programme provides participants with information, tools and skills to address this subject in their areas of work, and to develop pedagogic expertise to complement their knowledge. The programme is divided into four modules, all of which must be completed by participants who wish to attain the certificate. Course Duration: 1 Year, August 2012- August 2013 1. Teaching the Holocaust, 20, 21 and 22 August 2012: Intensive 3 day summer programme for teachers that addresses the complex subject of the Holocaust and how to teach it in the classroom. Lectures, interactive seminars, workshops, material and resources presented by renowned international Holocaust educators. 2. Learning from the Holocaust: 30 October – 02 November 2012: 5 day programme that includes a 3 day study visit to Krakow and Auschwitz-­‐Birkenau. In Poland, seminars, tours and lectures are incorporated into the schedule. The programme is supported by 2 separate seminar days, one in preparation for the study visit and one on reflection afterwards. 3. Irish Seminar at Yad Vashem International School, Jerusalem, July 2013: 8 day programme for teachers at Yad Vashem International School for Holocaust Studies. The course is specially tailored for Irish teachers providing an in-­‐depth exposure to the many facets of the Holocaust. The programme is supported by 2 separate seminar days, one in preparation for the study visit and one on reflection afterwards. 4.  Dissertation or special project There are four assignments to be completed on this programme: two essays (1,500 -­‐ 2,000 words each), one field diary and one dissertation (5,000) or special project.